It has been one of those days again. Somebody reported to me last night that the theme of the blog did not display the first photo of any page correctly as it appeared after a huge space. The problem only happened with Internet Explorer and everything was fine with Firefox. After I fixed the problem I finally ended up rewriting the entire theme to comment it better and to update things that were from many previous versions and I also started beautifying the interface. The day went by and I did not see it. In continuation of our stressful week today we had the leftovers from yesterday which were partly leftovers from some weeks back that we had frozen. As a first course we had the leftover chicken soup from yesterday that, as usual, was tastier on the second day. We did another quick Mexican dish with the leftover mole from yesterday which had the leftover shredded chicken cooked to make the soup yesterday. That’s a lot of accumulated leftovers. We made some enchiladas that are essentially tortillas dipped in a chile sauce. You start with some nice corn tortillas, in our case we used some JalapeÃ±o tortillas we bought Tuesday. You normally fry them in oil, but we just cooked them on the comal until nice and crisp. When the tortillas are nice and crisp, you just dip them in the chile sauce and fold them in half. In our case we dipped them in the mole and chicken from yesterday. 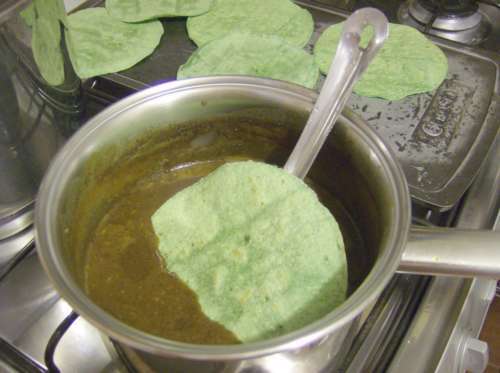 Once you have placed your folded tortillas on the plate you ladle more of your sauce over them. Traditionally like yesterday’s chalupas the enchiladas are served topped with grated cheese, and like yesterday we did not have cheese so we used a dollop of heavy cream on them. The meal was very tasty as usual and took a grand total of 10 to 15 minutes to prepare. Now we need to really think about what we will have tomorrow as we ran out of easily accessible leftovers and we will need to actually cook something. We had bought a nice big chicken breast yesterday and decided at the last minute not to prepare it and use it today. Normita prepared her famous chicken noodle soup again and she cooked the chicken in it. We had that as a first course. 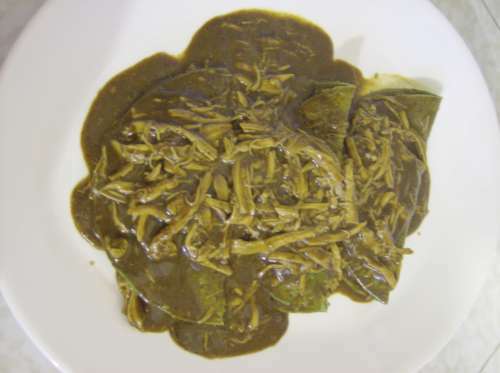 We had some mole almendrado we had used a while back and that we had frozen the leftovers. 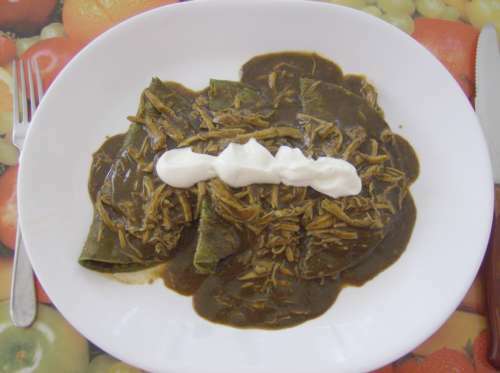 We normally buy fresh mole paste at the market and we use it in a variety of way. Normita added the freshly cooked chicken after finely shredding it with her fingers and reheated it in the mole. We had also bought some “chalupas” literally some “rowboats” yesterday. Chalupas are made with the same dough as corn tortillas and are shaped like little rowboats thus the name. 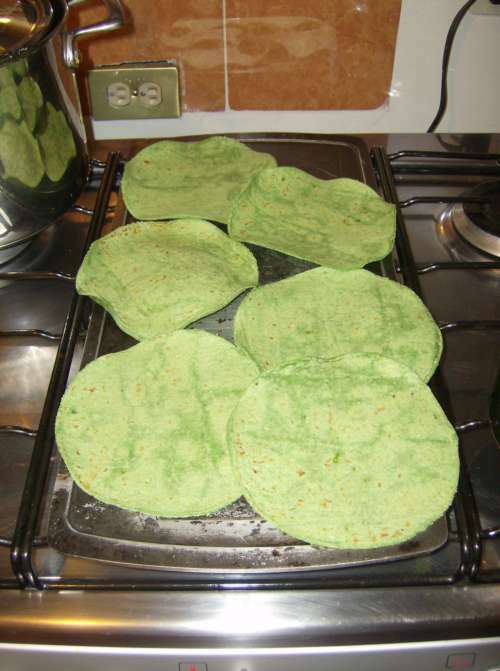 They are about as thick as 3 tortillas and are normally handmade with a little rim. The ones we bought looked machine made evenly cut from a thick sheet of dough, instead of hand-formed. They are easy to prepare, you put a few tablespoons of oil in a hot pan, or a comal and fry the chalupas in the oil until golden and crisp. You place the fried chalupa after draining the oil on a paper towel on your plate and butter them with a nice layer of refried beans. You then add to it some of the mole with chicken, and you traditionally top them with some grated cheese. Since we did not have any cheese to grate, we topped them with a dollop of heavy cream. 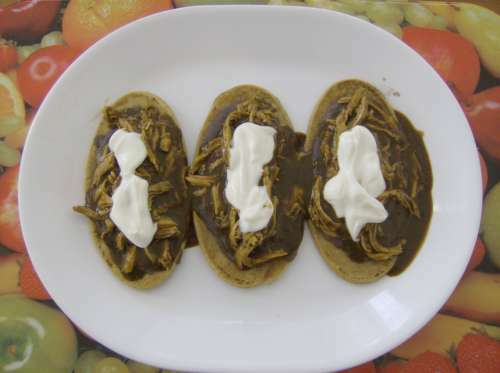 They turned out to be very satisfying and like many traditional Mexican dishes that you eat with your hands they were also very messy to eat, but that is part of the fun of good Mexican food. 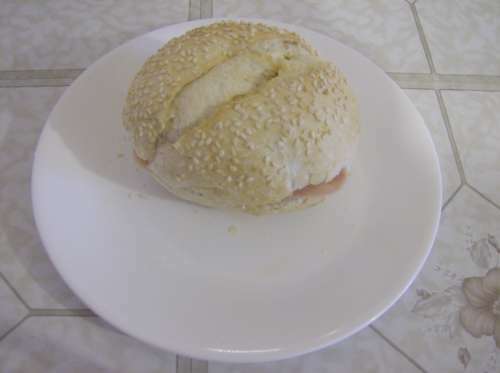 As mentioned earlier, today we had some simple ham and cheese sandwich. 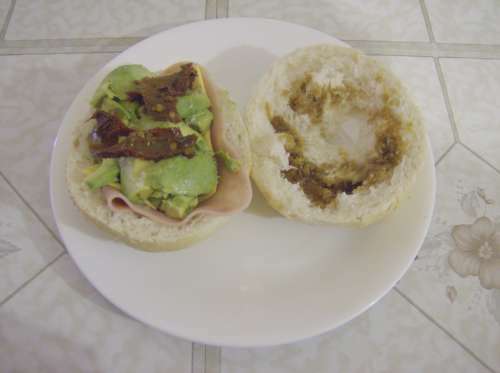 To make them tasty we added to the basic ham and cheese some fresh avocados, salt, pepper, and some great cooked chipotles from Veracruz that my mother in law had prepared and sent to us today via Normita’s sister. My mother in law Juanita is in town here, but the chipotles she uses are from Veracruz. They somewhat different than the chipotles normally available around here and have a more smoky flavor. Juanita cooks them with piloncillo (raw cane sugar cones) and some carrots and the results are very tasty. We have over a pound of them so we will use them a lot in the coming weeks. They make a great addition to many dishes and we used some pieces to spice up our sandwiches and some of the tasty cooking juices as a dressing. Today was one of those where we ran around all day without accomplishing much besides some basic food shopping in the morning. Things have been very stressful for us so far this week and we both have not been able to concentrate on much. I decided that it was not worth trying to do some important work and ruin it, so I spent the rest of the day doing some research on many project and gathering data so I can process it properly on a better day. We are actively looking for renting or buying a house in a good colonia of Mexico City. We have been renting classrooms and space for our various courses and conferences for a while and renting space for this in a good area of town gets very expensive very quickly. It prevents us from giving as many course as we wish, or making the courses as long as we wish. We also cannot cater to smaller classes like I prefer to do as we have to have a certain amount of people registered to justify the rental of a room for the course. Add to that that traveling time from where we currently live to most centric areas of town have increased from around an hour to from 2 to 3 hours each way 7 days a week, so even going to give the classes is getting more and more difficult and I do not see any real change except for getting worse. We want to remedy the situation by either renting or buying a house in a good area of town and use part of the house to give our courses and conferences. This would solve the problem of being able to offer as many course as we want, being able to offer course for smaller groups, and definitively eliminate the traveling problem. If anybody reading this post has something to offer us, or know of someone who might have something, please contact me directly as I am open to any suggestions. 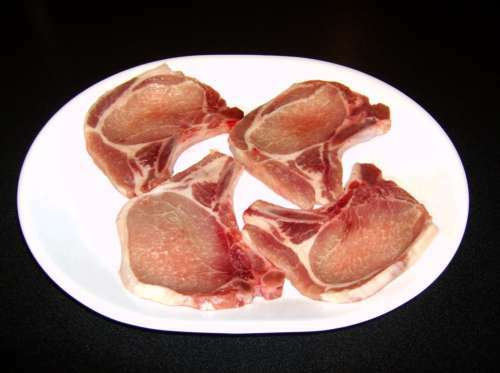 As mentioned earlier I cooked some very simply prepared thinly cut pork chops today. Here are some photos of the results. You might have noticed in the past few weeks that I am posting a lot of quick recipes and dishes made with frozen ingredients and dried condiments. The reason is twofold. First we are actively looking for a place to move where we could give all of our courses in-house instead of renting space for each course or series of course. So we are trying to go through our supplies and frozen reserves to make the move easier on us. To achieve this we are buying a lot less and using what we already have in stock. Getting back to the task at hand, I was not sure today what I would be serving with the thawed pork chops. I did not want to spend much time in the kitchen so I made one of my favorites, a simple couscous that takes about 10 minutes to prepare. I used some of last reserves of precooked couscous, which reminds me I should be adding that also to the list of things we will need to buy when we next go to town. Couscous is one of those things that makes a very satisfactory and very tasty side dish. It can be prepared in about 10 minutes if you use the precooked type and I plain love it. There are essentially 3 steps in preparing it. First, you boil some water and flavoring. 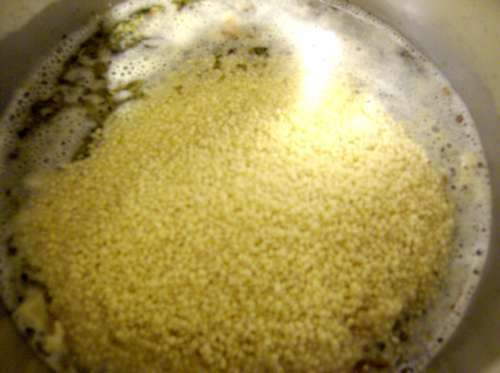 Second, when it starts boiling you just shut the burner and mix in the couscous. Third, you put the lid on the pot and wait 5 minutes for the couscous to absorb the water. You then add some butter and mix it in and server. It cannot be simpler. 1. 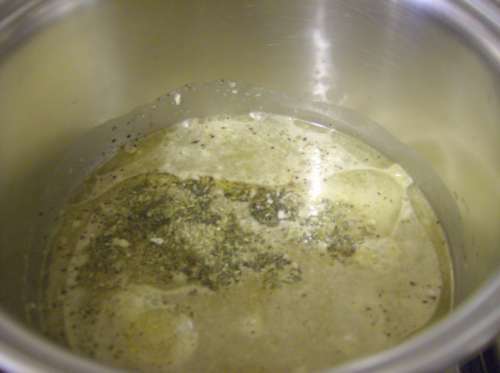 Put the water, oil, onions, garlic, chicken broth powder and herbes de Provence in a small pot. 2. Bring the water to boil over high eat. 3. When it starts boiling shut the burner. 4. Add the couscous and nuts and stir them in. 5. Put the lid on the pot and let rest for 5 minutes until the water is all absorbed. 6. Add the butter and mix in, then serve. 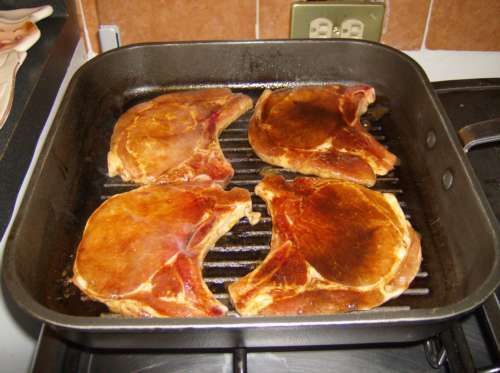 Today I defrosted the last of those thin pork chops we bought some weeks ago. 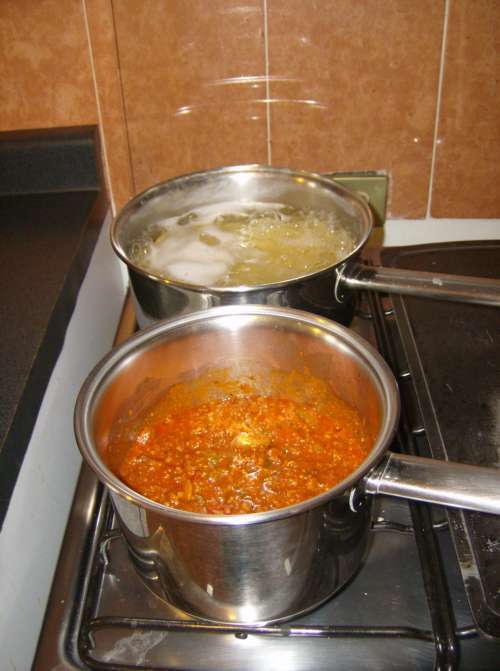 I was rushed for time and since the temperature is still high I did not want to spend much time in the kitchen. The entire meal was prepared in around 20 minutes. 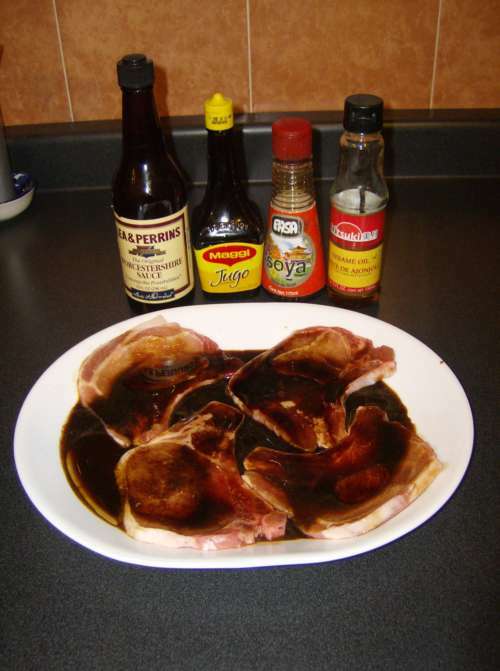 I simply marinated the thin chops for a few minutes with soy sauce, Worcestershire sauce, sesame oil and “Jugo Maggi” a vegetable flavoring sauce. Then I grilled the thin chops to perfect crispness on a grill pan. This took only minutes. 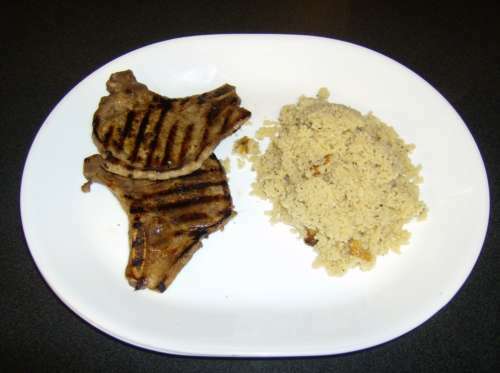 As a side dish I prepared a quick walnut couscous and a simple green salad. From entering the kitchen to the table only took a bit over 20 minutes and the results were very tasty. It is one of those types of meals that takes longer to describe than to actually prepare. 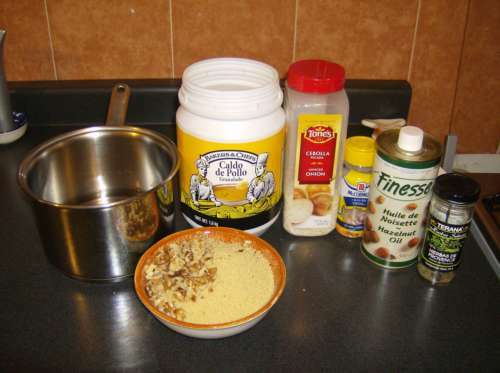 I will post some pictures before and also the recipe of the couscous. The pasta I finally chose for today’s meal was spaghetti rigati. 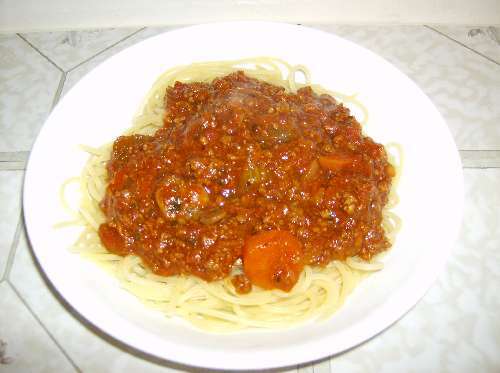 I cooked it to a perfect al dente, and with the heated sauce the meal turned out very good yet again. We relaxed a bit during the meal while watching a bit of TV, and now we are back at work for a few hours. The meal turned out exactly as I wanted. Very easy to prepare, as the sauce was from my private frozen stash, and also very tasty as the sauce was perfect as usual and the pasta was cooked like we like it. A great meal to end a great weekend.